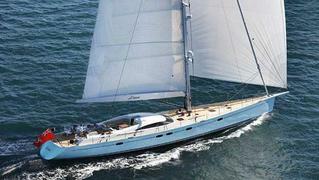 A call to Adrian Nicolle at Nicolle Associates brings more details of his latest listing, the 32m sailing yacht Liara. The flagship of the Performance Yachts range, this superyacht was built in 2009 to RINA class. Designed for the optimum combination of performance and comfort, Liara has a carbon hull and mast, a lightweight interior and a hydraulic lifting bulb keel. MCA compliant, she offers accommodation and amenities for up to eight guests in an understated interior finished in light, natural wood tones. Currently lying in Palma but departing for Sardinia next week, Liara is asking £8.5 million.